The event will take place on Thursday 6 December 2018 in Katowice, Poland, and is being hosted and supported by the City of Katowice. Transport is currently responsible for about one fifth of global CO2 emissions and nearly a third of transport-related CO2 emissions originate from urban passenger transport. Transport also contributes with at least half to the air pollution in cities, seriously affecting the health of its inhabitants. The Paris Agreement on Climate Change fully recognises the importance of non-state actors in implementing the agreement. City-level activities in the transport sector are becoming increasingly important, especially due to the multiple benefits of urban mobility action, reducing CO2 while at the same time improving air quality, tackling congestion, quality of life, traffic safety and public health. 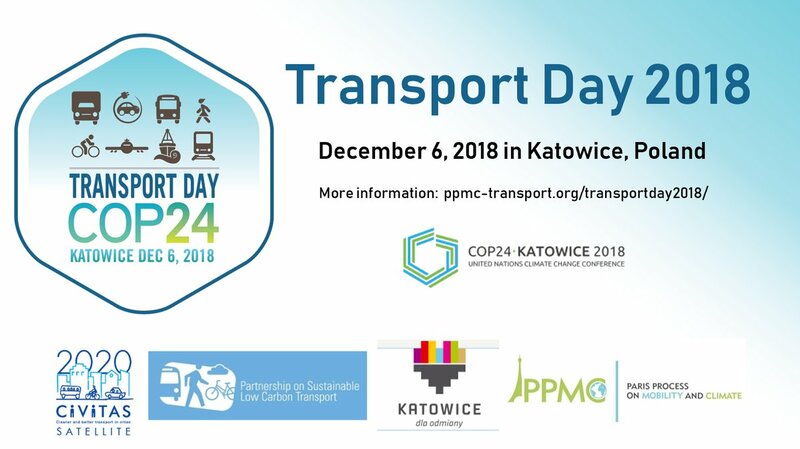 The Transport Day 2018 will highlight the strong role of cities in reducing greenhouse gas emissions and improving air quality by implementing measures in the transport sector. Importantly, the event will address how national governments can support the potential of cities through framing activities for successful sustainable urban mobility actionm such as national legislation, common planning tools, empowering cities, funding to cities). Ultimately, the event aims to prompt the improved treatment of urban mobility in the Nationally Determined Contributions being developed by States in 2019 and submitted to the UNFCCC in 2020. The opening speech will be given by Ms Violeta Bulc, European Commissioner for Transport. A draft programme and registration can be found here. Please note that the event will take place-off site at “Miejski Dom Kultury” on ul. Markiefki 44a, which is about 10-15 minutes walk from the COP24 congress centre. No COP accreditation is required to attend and participation is free of charge.